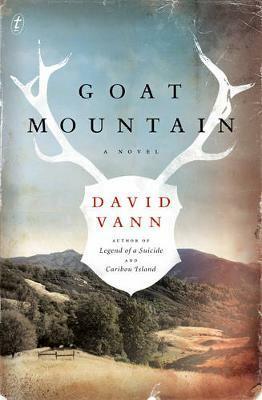 Goat Mountain is a ride of a novel. It’s dark, brooding, violent, powerful and brilliant because David Vann knows how to place the reader right alongside his characters, whether we want to be there or not. The narrator, a young boy, transports us back to a Northern Californian summer of 1978. At the age of eleven he’s on a hunting trip with his grandfather, his father, and his father’s best friend, Tom. The boy is bursting with excitement: this trip marks his rite of passage from boyhood to manhood and this year he’ll be allowed to kill his first buck. He’s also nostalgic for a time that isn’t his and angry that there are fewer animals to hunt than there were twenty-five years earlier. Itching to kill, the boy fantasises about shooting birds as he rides in the back of the pickup on the way to the family property. On arrival, the group is confronted by the sighting of a poacher on their ranch. While spying the trespasser through the scope of a rifle, the boy pulls the trigger. In the aftermath, Vann tackles philosophical and theological themes. He peppers the story with meditations on the Cain and Abel narrative and asks why we would kill, and whether we’re hard-wired to do so. Vann explores the masculine family dynamic and the importance, or relevance, of tradition in our modern culture, in particular a culture that worships the gun. Alongside this, he evokes the landscape beautifully and Goat Mountain itself is as important a character as those of flesh and blood. I will be recommending this brutal and darkly beautiful novel wholeheartedly leading up to Christmas, although I know it won’t be everyone’s cup of tea. But those who do enjoy it, such as myself, will find it to be masterful. Jason Austin is a buyer and bookseller at Readings Carlton.